Over the past few weeks University and College Union (UCU) have announced a series of strikes in order to defend their pensions. Proposals from Universities UK would have devastating effects on their pension schemes with staff set to lose £10,000 per year from their retirement income. Universities UK has ignored staff concerns and is committed to a hard-line approach without compromise. The strikes began today, with 14 days of industrial action spread over the next few weeks planned by UCU. The proposed changes should be seen in the context of the huge cuts to further education. As universities are more starved of government cash, we’ve seen job cuts, poorer working conditions and even more privatisation. This provides an open door to arms companies like BAE Systems who pay universities to design and carry out research work which will be used in developing weapons sold around the world. Solidarity between university staff and students is vital in building a movement committed to ending university ties with the arms trade. How can you support the strike? 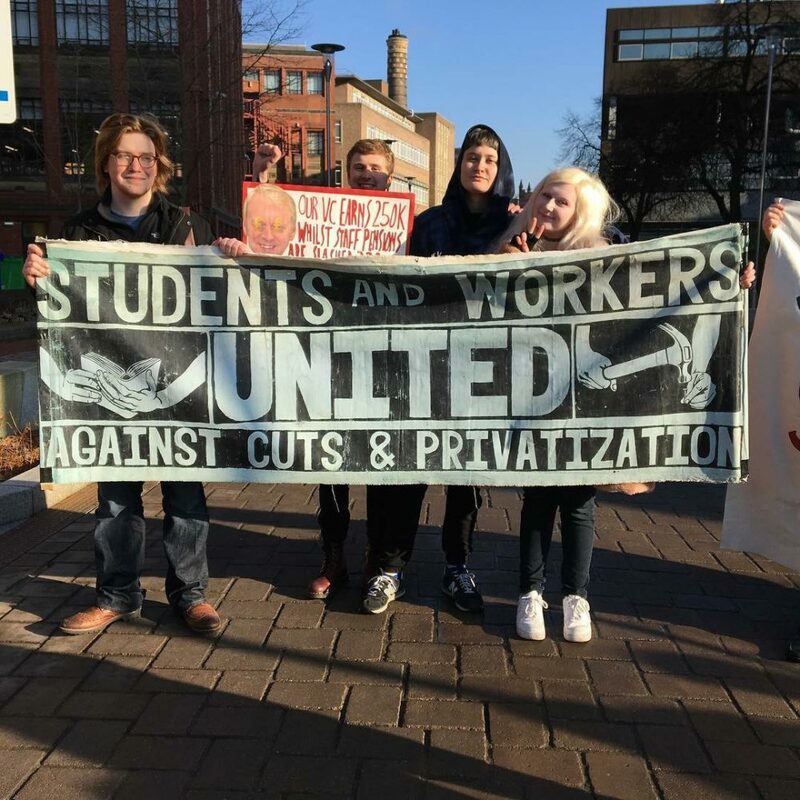 Check in with your student union to see how they’ll be supporting the strikes. At the University of Liverpool, the students’ union will be hosting teach outs, where striking lecturers and students will hold alternative lectures – including one on the arms trade. We can help you to run an anti-arms trade session at a radical teach out at your students’ union. Avoid booking university-owned rooms on strike days, and instead join a picket line in solidarity! Some students’ unions will be closed in solidarity, so remember to book any events on either non-strike days or in an alternative venue off campus. Get in touch if you need support in paying for room costs. Email your vice chancellor to ask for fresh negotiations. Donate to the UCU Fighting Fund to support your lecturers. Find out more about the strike.